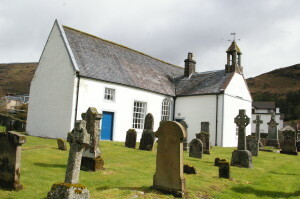 The parish kirk of Lochgoilhead, on the site of its medieval predecessor. The ancient church of Lochgoilhead stands in the centre of a delightful village, in the north-eastern corner of Cowal. You will find the church in its quiet and secluded graveyard, a little haven of peace. The gate looks locked, but it’s not. Pull out the pin, draw back the bolt, and enter the kirkyard. Incorporated into the present building, forming its eastern and western wings, are some parts of an earlier church. They probably date to around the 1440s, and might have been erected by Duncan Campbell of Lochawe. Up to that point the church had been in a state of collapse, and he seems to have taken measures to restore it at the same time as giving it to his newly established Collegiate Church at Kilmun. Lochgoilhead church appears in early documents as ‘the church of the [three] brethren’ – ecclesia Trium Fratrum in Latin, and Kill nam brathairn (properly Cill nam Bràithrean) in Gaelic. Unfortunately, we have no clue as to who the three holy brethren were. Further research might reveal when their feast-day was, and that might help identify them, but till then we are at a loss. The inscription is hard to read, but may be part of a Roman-lettter alphabet: B, c, d, E, F and … L, M, N.
There are a number of interesting carvings inside the church, at least one of which probably predates Duncan Campbell’s rebuilding by centuries. The earliest is a fragment of stone bearing lettering on two adjacent sides. On one side the Roman-letter inscription appears to represent part of an alphabet. The top line has a blank area where the A would be, then what looks like a B, and then a lower-case d. Squeezed between the B and the d a slight mark suggests a possible c. The following E is clear enough, and the final letter in the top row may be a short-stemmed F.
The second row has a few marks which are illegible, and the last three characters may by L, M and N.
If this is an early medieval representation of part of the alphabet, we may consider various reasons for someone having made such a thing. It might have served to instruct students, part of a complete alphabet, the rest of which is now lost. It may have served some liturgical purpose, too. The rite of consecration of a church included the writing of an alphabet across its floor. Did this stone have some relation to that rite? Or was it simply a rough piece of practice-work by someone learning to inscribe stones? The other carved side of the stone bears an inscription, now illegible, in Roman letters and ogham. An adjacent surface of the same stone also has letters carved on it. Some of them are Roman-type lettering, but very hard to read. Others are written in ogham, a script which first appears in Ireland probably in the fourth century, devised to represent the sounds of Gaelic speech. Though its principles were based in some ways on Roman ideas of writing, its letter-forms are quite unlike Roman letters being composed of dashes and dots placed in clusters of 1 to 5 for each letter, each cluster being on, across, above or below a stem-line. There are often difficulties in deciphering ogham inscriptions in Scotland, and this one is no exception. No meaningful word can be read here with any confidence. Part of a broken millstone, marked with a cross, may have served as a grave-marker at the early church of Lochgoilhead. Another stone at the site may also be of Early Christian date. It was originally part of a mill-stone, but at some point it was broken and given a new use (possibly to mark a grave) and at that point it was carved with a simple cross. The cross is carved within a circle with a diameter of 120mm. 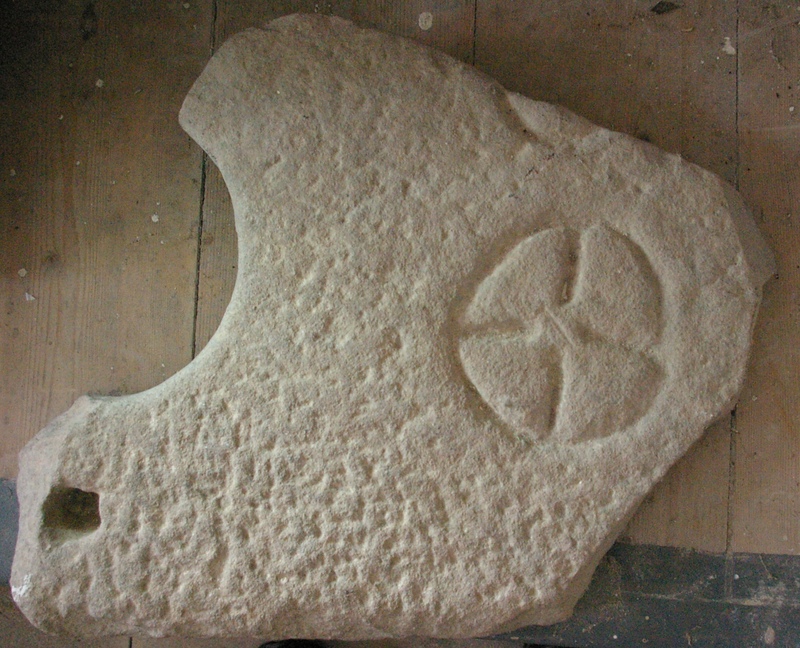 There are other examples of mill-stones being carved with crosses in the archaeological record. Mill-stones were also used as bases on which crosses were erected, the central hole serving as a socket in which to stand an actual cross of wood, or perhaps of stone. One such is mentioned in Adomnán’s Life of Columba as marking a place where the saint rested on his way from Iona’s barn to the monastery shortly before he died. Adomnán says that the cross was still there when he was writing in the late seventh century (Vita Columbae iii, 23). One might wonder if the association between mill-stones and crosses in those early centuries was purely a matter of practicality – a smart solution to an engineering problem, or a handy way of re-using a useful piece of stone. Or did the early Christians make a more profound connection? Mill-stones grind corn to make flour. Flour is baked to become bread. And bread is blessed and broken in the Christian assembly, following the example of Christ at his last supper, to become his Body, the commemoration of his death and resurrection, and the sacrament of his presence among his people. In the presence of this modest little fragment of stone, do we hear the echo of an early Christian meditation on the Eucharist? 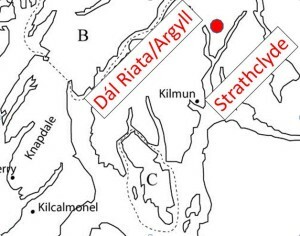 Clach a’ Bhreatunnaich (the red dot) stands as a conspicuous landmark between the ancient kingdom of Gaelic Dál Riata and the British kingdom of Strathclyde. On the hillside above Lochgoilhead is a huge boulder, quite consipcuous in its exposed position (NN217025). It is called Clach a’ Bhreatunnaich ‘the stone of the Briton’. 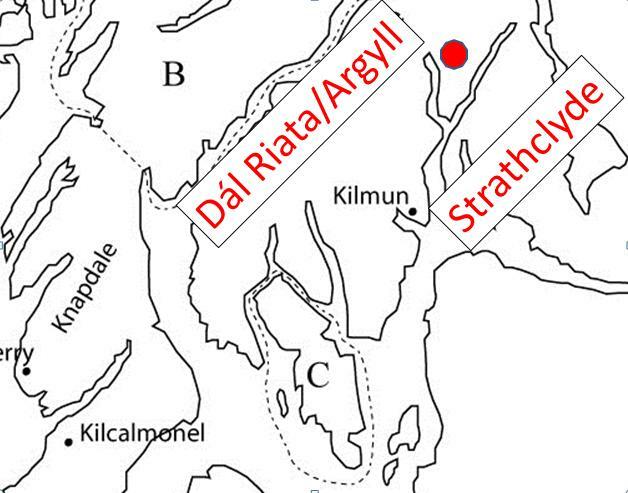 It may have got its Gaelic name from the fact that it was seen as a boundary marker between Cowal (part of the Gaelic territory of Dál Riata) and the neighbouring British- (or Old Welsh-) speaking territory of Strathclyde. Why not spend an hour going up the hill to have a look at it? Lochgoilhead also lies in the midst of Argyll Forest Park, and the surrounding countryside is full of attractions for walkers, cyclists, birdwatchers and anyone who enjoys the wilderness. Getting Here: for a good OS map of Lochgoilhead and the area, click on ‘View Larger Map’ below. The church site is marked by a cross (+). – You can walk or cycle from Kilmun, but it’s a long stretch for a single day’s walk. You could begin somewhere a little closer on Loch Long, Ardentinny for example, if you are walking. Much of this walk is along forestry track, up and down hills and along the loch-side, and it is not a car journey. See Routes: Dunoon to Lochgoilhead for details. By car from Dunoon, go north, taking the A815 up Loch Eck-side, to Strachur and about seven miles beyond that turn right on the B839, which takes you all the way to Lochgoilhead. For local accommodation, see the Accommodation pages with places for North Cowal. SERVICES: For times of services in this church, see the Pray With Us page of this website. Also note that on the first Wednesday of every month the local church organises a ‘Coffee and Chat’ event in the Lochgoilhead Village Hall. Visitors are always welcome, and it’s a great way to connect with local people. And who can say no to a free cup of coffee?